I am a huge fan of ghee! Every few weeks I will make a batch so that we always have it on hand for the 10 amazing benefits of ghee. Ghee is simply butter that has been cooked to remove any water and solids. It is the end result of a chemical process whereby all the butter is cooked down till all the water evaporates and the milk solids sink to the bottom of the pan. It is then strained and poured into a mason jar. As it’s a pure oil, it will not go rancid and does not need to be refrigerated. So what is all the fuss? Modern science now verifies what Ayurvedic health science has said for thousands of years: Ghee has a host of health and cooking benefits and is good for the mind and spirit. Here are the top 10 amazing benefits of ghee! The primary fatty acid in butter is called butyric acid, so named because it was first discovered in butter. Butyric acid, is a short chain fatty acid (SCFA) that the intestinal tract thrives on, as it helps to protect the integrity of the gut wall. The process of making ghee yields an even more concentrated source of butyric acid than butter. However we can make butyric acid ourselves with our own microbes.. Much of the healthy fiber that we eat directly feeds the microbes in the gut. In turn, these gut microbes convert this ingested fiber to butyric acid, the primary ingredient in ghee. The cells of the colon use butyric acid as their preferred source of energy and their major substance for supporting the health and integrity of the intestinal wall. The American Society of Microbiology reported on a study that showed patients with inflammatory diseases such as ulcerative colitis and Crohns disease do not produce butyric acid, and have low levels of fatty acids in their intestines. 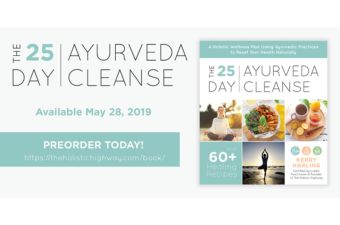 In Ayurveda, taking ghee internally through ingestion and ghee enemas has been done successfully for thousands of years to support intestinal health and function. 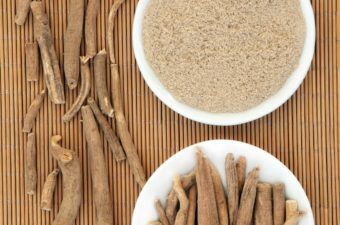 Interestingly these studies are now proving the science behind Ayurveda. Were you aware that in order to absorb all of the extremely healthy fat-soluble nutrients in your food, you’ve got to eat them with some fat. So maybe you add olive oil to your salads or eat your veggies with butter to help absorb all of those valuable nutrients. One recent study, published in the European Journal of Clinical Nutrition found that substituting ghee for vegetable oils can help reduce the risk factors for heart attack and stroke. Another study published in American Journal of Clinical Nutrition found that eating saturated fats – like ghee – prevents the progression of heart disease in women with metabolic syndrome. When fats are “unstable” they can easily become oxidized and go rancid quickly. And that’s not so great when it comes to your health. Rancid, oxidized oils expose the body to free radicals which can damage cells and DNA. These oils can also irritate the walls of your arteries and promote dangerous inflammation. It’s the polyunsaturated long chain fatty acids that are the most unstable of all. In fact, consuming oils that readily oxidize (including corn oil, soybean oil, palm, canola, and other “vegetable” oils) is associated with a wide range of inflammatory conditions, including heart disease, diabetes, autoimmune diseases… and even cancer. One recent study in the journal Immunity looked at the effects of dietary fatty acids and how they directly impact the central nervous system autoimmunity via the gut. This study concluded that fats with long chain fatty acids worsen disease. This data demonstrates a direct dietary impact on intestinal-specific, and subsequently central nervous system-specific, Th cell responses in autoimmunity, and thus might have therapeutic implications for autoimmune diseases such as multiple sclerosis. Ghee on the other hand, has only about three percent polyunsaturated fat and nearly 60 percent saturated fat. It is a short chain fatty acid and its composition is highly stable. 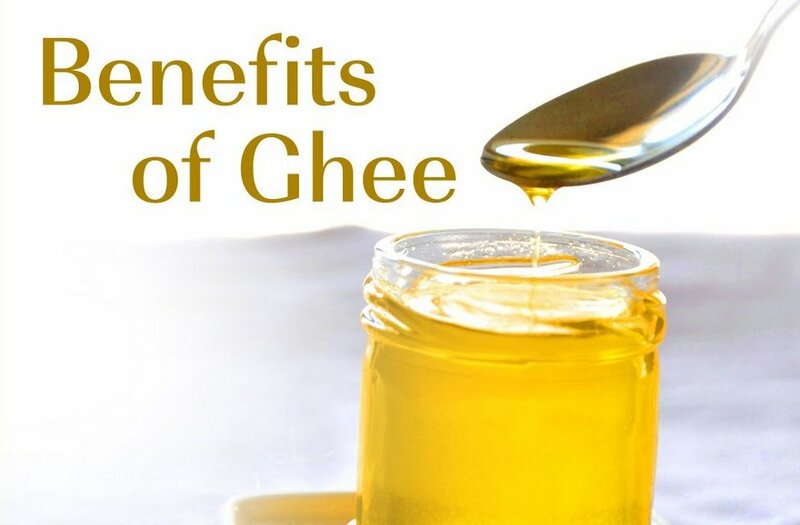 That means that not only can it be stored for extended periods, it also remains intact under high heat cooking, thanks to a flash point of 518 degrees F.
Ghee has been found to have protective effects against cancer, thanks in part to a powerful compound called conjugated linoleic acid, (CLA). CLA acts an antioxidant. It also reduces inflammatory compounds and encourages cancer cells to self destruct (a process known as apoptosis). Conjugated linoleic acid or CLA is higher in grass-fed beef and in products made from their milk. This is one of the main reasons its important to choose grass-fed butter for your ghee. Initial studies indicate that grass fed ghee, which is higher in CLA’s reduce inflammation, and actually lowers body fat. in ghee! In this study on mice, the researchers implanted breast cancer cells into the subjects. Some of these mice were fed a diet with a high level of corn oil, which attempted to, “approximate the fatty acid composition of the American diet.” Another group received CLA in addition to the standard diet, while one final group received CLA combined with ghee. What the scientists discovered was that the growth and size of the tumors were 2.5 times larger in the corn oil group than the mice which were supplemented with CLA. They also found that the group which consumed ghee in addition to CLA had far fewer areas where cancer had taken hold (metastases). The ghee also reduced the amount of CLA that was necessary to have an effect. In other words, ghee amplified the beneficial cancer-fighting effects of (CLA). That’s strong bones for you! As a fat-soluble vitamin, K2 plays many important roles in the body. Perhaps its most critical role is that it helps calcium move into the bones and teeth making them stronger. 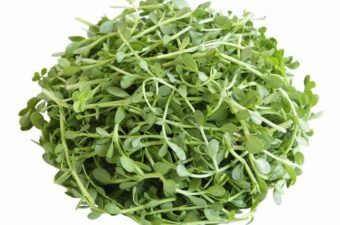 It also helps calcium move out of arteries and other soft tissues. This reduces calcifications – atherosclerosis – and the risk for heart disease. Unfortunately, it is estimated that up to 80% of Americans don’t get enough of this important nutrient. The good news is that it is abundant in grass-fed ghee! Ghee is rich in healthy fat-soluble vitamins such as vitamins A, D, E, and K. These vitamins are important for promoting bone and brain health, and for boosting the immune system. If you have gluten sensitivity, leaky gut syndrome, or any inflammatory digestive disease such as IBS, Crohn’s or certain pancreatic disorders, it could be due to a problem absorbing vitamin A. By using ghee for cooking, you can increase your intake. Vitamin D, also a fat-soluble vitamin, can be made in the body after exposure to sunlight. However, during those chilly, dark winter months, it can be difficult for our bodies to make enough of this vitamin. Ghee benefits the body by improving moisture and contains vitamin E, which is an antioxidant whose role is to repair damaged skin, balance hormones, improve vision and help to balance cholesterol. Fat soluble vitamins are essential to maintaining a healthy metabolism and various biochemical functions in the body. I often hear from my clients that they don’t want to eat ghee because they are trying to lose weight. Energy from short-chain fatty acids in ghee actually burn other fats in our system, leading to weight loss. In Ayurvedic practice, ghee is a central part of the diet that is believed to help jump start the digestive systems. The belief is that ghee actually attracts other fats and removes toxins that are traditionally difficult to eliminate. Another one of the health benefits of ghee is that it is lactose and casein-free. Many of my clients do not eat dairy anymore because they they have a milk allergy, which may stem from a heightened sensitivity to casein, or to lactose. A casein allergy can cause swelling of lips, mouth, tongue, face or throat, hives, or congestion. Lactose intolerance folks may have symptoms that include bloating, gas, nausea, vomiting, gurgling and cramps. However, most people who are lactose or casein intolerant have no issue with ghee. Why is ghee’s smoke point important? Well it’s because you can cook and fry with ghee and it will not break down into carcinogenic free radicals like many other oils. The oils we use such as peanut oil, soybean oil, corn oil and canola oil are genetically modified and have a lower smoke point. When we heat oils above their smoke point it destroys the essential phytonutrients. Ghee is a healthy oil that can be used in all recipes especially those that need a high heat. In addition, many fats change their fatty acid structure when heated and become unhealthy. So for example, olive oil shouldn’t be used for cooking and only used to add after cooking, in dressings or sauces. Ghee is considered one of the best ayurvedic superfoods and we have demystified ghee and given you 10 amazing health benefits of ghee. Want to make it yourself? Follow my You Tube video on how to make ghee or you watch the Health benefits of Adding Ghee to your Coffee. Feel free to contact me if you would like more information about amazing health benefits of foods.